B&Bsuite 2 Bed/r both hv mod. bths.Lrg lounge,Ocean views+own deck. Prices Quoted DO NOT include Breakfast. Should you wish to be on the Breakfast Plan, please ask us. ABOUT YOUNG ADULTS. PLEASE INQUIRE, AS BED CONFIGURATION MAY NOT SUIT YOUR NEEDS. Watch Hill Manor's B&B Suite is conveniently located and only 10 minutes from Bermuda's International Airport, in Smith's Parish. Suitable for 2,3 or 4 guests. Ask about our Breakfast Plan. If you don't, you will be missing one of the best breakfast in Bermuda. GARDEN VIEWS, QUEEN BED, MODERN BATH WITH TUB AND OVERHEAD SHOWER. The suite has a large lounge, with seating for five persons. It's modern with Cable T.V., WiFi, under counter fridge/freezer, microwave, electric kettle, for coffee or tea. (NOTE: there is no Toaster) This unit is for B & B guests. Price quoted does not includes Breakfast Plan. All linen provided, too include, pool AND beach towels. We also can loan you beach chairs and umbrella. Beach is only a 5 min. walk from the front Gate. The property looks east, overlooking the John Smith's Bay area and the beautiful South Shore, down as far as Castle Roads and Bird Rock. Awesome sunrises each morning! The property is well situated on Watch Hill, in Knapton Estates , with great vistas of the coast, reef line and the ever changing blue and turquoise water. In the spring, one can see the whales migrating north and sometimes they stop just in front of us and frolic and breach. The property also boasts a full size Tennis Court with ball machine, Squash Court, and Golf Driving Range plus putting mats. These may be used during day light hours, by reservation only. There is an Indoor/Outdoor pool for guest's enjoyment, which is open from 7 AM till 6 PM daily. Both myself and my lovely Dutch wife, will be certain to make your stay most memorable. We speak English, Dutch and German with a smattering of Spanish and French. A breakfast program is available between 7:00 AM and 9:00 AM with you deciding the time you would wish it to be served. The menu is varied and we will discuss this with you the day before service. Please note : The group will all eat together at the same time, as decide upon. Beach; John Smith's Bay, one of Bermuda’s Premier public beaches, just a 5 minute walk from the front gate. Golf; Mid Ocean Golf Club and Rosewood Bermuda, Resort, Golf & Beach Club are a 5 minute moped ride away. We can reserve Tee-times for you. Restaurants; 5 Restaurants within 5 - 10 minute drive, Plus 2 Cafe/Diners with Take-away option. Hamilton and St. George's for a more varied selection. Supermarkets: One within 3 minutes’ drive, others 5 and 7 minute drive. Bus Stops; 2 choices of Routes; South Shore 5 min. walk, Harrington Sound 5 min. walk. Hamilton City (Capital); 15 minute drive by bus, cab, moped, or Rental CAR. Town of St. George's: 25 min. drive by cab or moped. By bus, 35 min due to may having to transfer at Grotto Bay. We can arrange many adventures for you if you wish; Taxi Tours, Bus Tours, Deep Sea Fishing, Jet Skiing Tours, Sailing, Water Skiing, Wake Boarding, etc... .
Other Amenities: Sleep on 1000 thread count Egyptian Cotton Linens. Quality Terry Cloth towels and wash cloths. We have a separate shared Laundry Facility for our guests, with Soap and Fabric Softener provided. Full Tennis Court with ball machine for practice, Squash Court, Golf Driving Range, Practice Putting mats, Indoor/Outdoor Pool. Fishing just 5 minute walk from front gate. We are local and have a vast knowledge of the island, which we would love to share with you. We look forward to meeting you and making your trip to beautiful Bermuda, a most memorable one. We are a NON-SMOKING PROPERTY Inside and Out. We Do NOT ACCEPT CHILDREN, due to the topography of our property. A varied life one might say! Schooled in Bermuda and the U.S.A., Military Academy, U. of Maryland, Bermuda Hotel College. Worked in a variety of positions after doing my hotel apprenticeship. i.e. Every major hotel in BERMUDA during the 60's & 70's Past OWNER of: "The famous," Hog Penny Pub, Fisherman's Reef Seafood Restaurant and M.R. Onions, Restaurant & Bar, "A fun place to eat and drink". CRUISE STAFF, Holland America Cruise Line: 3 World Cruises + OTHERS. Owner of South Pacific Distillery , Nelson , N.Z. Winner of bronze Medal for our Rum , at RumFest 2000, held in Barbados. Gold Medal, 2017 International Spirits Show, London, England. Spent 20 years down under, in Nelson, New Zealand and moved back to Bermuda in 2015. My lovely wife is Dutch and has the clogs to prove it! She has lived in N.Z. for 35 years and decided she wanted to live somewhere warm. So here we are!!!!! A rather large property that was in need of some T.L.C. ! It is the first property we looked at 6 years ago while on holiday in 2012.. It lingered on the market due to it size and the amount of work needed to bring it back. Built in the mid 1960's and after looking at it, we just knew it was too big for just the two of us. When we returned in the summer of 2014, we looked at over 60 houses for sale but none had the charm and character that this house has. It is well off the main road in a quiet neighbourhood, has a view to die for and is East of Hamilton. It is close to my golf club, not that I've had much time for golf as of late! We've been very busy restoring this, "oldish" sort of LADY. It has truly been a labour of love, so to speak. We have now totally renovated all the guest rooms and areas. The pool area has been completely redone as have all the decks and outdoor space. Our friends just love it and we are certain you will too!. 2017 We've just completed installing a new custom kitchen, we have also raised the ceiling in the foyer by 1 metre, added a new Powder Room, with plumbing off the foyer. This space has all been re-tiled with a highly polished Italian tile. Foyer and living areas have been refurbished also. Our dining-room has been completely refurbished including all walls resurfaced, cedar table and chairs refinished and new lighting. May 1st, 2017 . This has now all been completed. Jan. 2019 The exterior of the house has now been completely repainted. It's new colours are more modern than the old ,"Bermuda Pink". It is now Moroccan Sand, with Royal Blue eves and shutters. The windows and frames are white. Close to the Airport, so NO $70 or $80 cab fare. Approximate fare $25.00 . BEACH is a 5 minute walk from our front gate. Lovely pool overlooking the South Shore and on down the coast. Relax in a chaise lounge and have a complimentary Swizzle. Tennis Court . We have loaner racquets. Squash Court Golf Driving range (netted) Must have own equipment. Putting mats Play, "Bocce", on the lawn Half way between Hamilton and St. George. 15 min to Hamilton 20 min to St. George. Off the main road. Quiet neighbourhood Stunning views. Free WiFi. Free dedicated guest Laundry, plus ironing facility. Hair Driers. Supermarket 3 min. away. 2 x Golf Courses, 5 min away. Churches 3 to 7 min away. Restaurants 4, within 7 min. Fishing of the rocks, 5 min. walk. Lovely indoor/outdoor pool with Chaise Lounges, umbrellas and tables. "AIR CONDITIONING" All areas of WHM are air conditioned/heated We now have a CHARGING STATION FOR THE ELECTRIC "TWIZY" CARS ON SITE FOR YOUR OVER NIGHT CHARGING CONVENIENCE. (NOTE: there is a fee for this ) If you're a B & B guest, you'll be amazed at your Breakfast. AND..... LAST BUT NOT LEAST, INEKE & BRIAN AS YOUR HOSTS. toilet, combination tub/shower, tub, bidet, modern bath. Also heated towel rails, and hair driers. The La Garza B&B Suite Bathroom is a modern bathroom which is fully tiled. It contains an enclosed shower with excellent water pressure, a large vanity with plenty of space for personal effects, an eco flush toilet and heated towel rack. Quality towels, soaps & shampoos are supplied. Hair dryer supplied. Bathroom #2 for B & B suite: modern fully tiled with tub/shower. Excellent water pressure. Toilet & Bidet . Large vanity plus shelf for cosmetics etc.. . Watch Hill Manor Apartment Bathroom is a full bathroom and has recently been renovated. It is totally tiled with a bathtub with overhead shower, vanity, toilet and heated towel rack. All Bathrooms have the following; Quality towels, soaps & shampoos conditioner are supplied. Hairdryers supplied. Shower caps and make-up remover. The Outdoor Swimming Pool area has its own large modern bathroom; toilet, vanity, shower and changing facilities. You may use this ,if you require a late check out to shower and change. Just a 5 min. walk to the beautiful John Smith's Bay. A small pink sand beach which is generally not very crowded unless it is a weekend or public holiday. One can also fish of the rocks . By Bermuda Standards we would be, Down de Country! We live east of Hamilton, where only 1/3 of the population live. Knapton Estates is a private road, where we have little traffic and little noise. Flatt's Village is a very quaint village which only 5 minutes away by car or moped. There are several restaurant here, along with the Bermuda Aquarium & Zoo. This area is very quaint and picturesque. John Smith's Bay which is a 5 minute walk from our gate. One of Bermuda's smaller prettier beaches and not so crowded. Our view also takes in the Mid Ocean Club Beach and the Rosewood Bermuda beach. Distant views of the world famous Mid Ocean Golf Club. We can make tee times for you should you wish? Fabulous views overlooking the South East shore of Bermuda. One can whale watch from the observation deck of the house in the spring, as the whales migrate north to the Arctic. South East looking down the coast of the South Shore to encompass Charles Island and Bird Rock. The reef line is a prominent feature in our view, with clear turquoise waters looking out to sea. Free local calls from the main house. We urge you to set up a plan with your own telephone supplier, as Bermuda is on the U.S.A. grid. Totally air conditioned. COOL/HEAT in all units. Totally heated, if you get chilly. All linens are high quality cotton with 850 thread count or more. Yes for mopeds and mini cars . 100 % cotton towels provided. Plus, beach towels and pool towels. Tennis Court, Squash Court and Golf Driving Range. Plus Fresh Water pool. Bocce Ball Tennis balls available at cost $7.50 for a can of 3. ALL UNITS HAVE APARTMENT STYLE UNDER COUNTER TYPE FRIDGE FREEZER. Microwave ONLY. NOTE: WE DO NOT PERMIT COOKING IN THIS SUITE ONLY RE-WARMING of PREPARED FOODS in the microwave. In the B & B Suite Lounge. The La Garza B&B Suite has a French Press, ( plunger) We supply coffee, sugar and milk. Also available is a selection of Teas. The Watch Hill Manor La Garza B&B Suite has coffee, tea, sugar, milk, bottled water and some condiments and spices. Plus a fruit plate on arrival, also Cheese, Pate, Crackers and a bottle of wine. The La Garza B&B Apartment Suite has utensils, dishes, cups and glasses, flatware, for for up to 4 people. The La Garza B&B Suite has a fridge/freezer microwave, kettle for tea & coffee. WE DO NOT PERMIT COOKING IN THIS SUITE ONLY RE-WARMING of PREPARED FOODS. B&B suite does not have an inside dining area. We encourage our B & B guest to try the many available restaurants which are near by. You may if you wish, dine on your private deck, "Al Fresco." Cable T.V. sports channel included. Some. If you take one please leave one. Well kept gardens and manicured lawns. Sun Deck where you can Whale Watch from. You may rent these from a Local Livery. Several, all with stunning views. Both units have their own private patio with table, chairs and umbrella. We will loan you beach chairs and umbrella to take to the Beach . Our property has many levels which means many steps. ASK ABOUT YOUNG ADULTS 14 upwards. We also will provide you with all soaps, shampoos and shower caps plus, make-up remover. Free laundry detergents We will drive you to the supermarket and restaurants that are within our area. Beach chairs and umbrella for the beach. We provide both beach and pool towels. If you wish a LARGE beach towel you may use this but must give a $20 Deposit which is returned, when you return the towel (s) Heated Towel Rails. We will arrange Taxi service for you as required. Amazing property, just as advertised! Our family was looking for a long weekend to get away from the cold weather and Watch Hill Manor delivered. It had everything available to make the stay perfect. The location is in walking distance to the beach and bus stop, we made use of the tennis court and pool. Our host Brian could not have been better. He makes a wonderful breakfast, enough to last past lunch. He also was helpful in arranging dinner times and rides to areas of interest and providing us information on sites to see. We would love to go back! It was a pleasure meeting you all and happy you enjoyed your stay with us at Watch Hill Manor. We do hope you will visit us again soon.... but next time for a bit longer, as there is still much to see and do, as you only had 3 short days with us. Wishing you a busy summer with your VRBO rental and look forward to meeting you once again. Beautiful property with a great host and great views! We loved our stay at Watch Hill Manor! Brian was a great host. He is full of knowledge of the island and gave us tips to structure our days. The property is beautiful and is just a short walk away from the beach and bus stops. Brian is a great chef as well, cooking us tasty breakfasts each morning. I would highly recommend staying at Watch Hill Manor. Thank you for the 5 Star review and both Ineke and I are delighted you enjoyed your time with us and also Bermuda. We do hope to see you again should you return to our fair shores. You've our number and directions, so just give us a jingle when you're ready. In the mean time, wishing you a grand weekend this coming weekend. My wife and two daughters, aged 23 and 17, just returned to Atlanta following a wonderful one week stay at Watch Hill Manor. The Hetzels are wonderful hosts who have created a touch of paradise with their lovely home and grounds overlooking the south shore of Bermuda. We stayed in the two bedroom apartment with two bathrooms, all tastefully decorated with terrific amenities for your vacation. We loved the very comfortable beds (better than a 5 star hotel) and spacious bathrooms with great water pressure for our showers (something else you don't always get at a good hotel). We especially loved Brian's gourmet breakfasts every morning- omelets with fresh vegetables from Brian's garden, homemade French Toast, pancakes and a full English Breakfast one morning that brought back wonderful memories of our trip to England several years ago. Brian is a veteran of the hospitality industry and it shows. He could teach a master class in how to run a 5 star resort. We were also very grateful for Brian's kindness and willingness to share his vast knowledge of Bermuda and all it has to offer. We will definitely be back. Wow! You finally ," got published" !!!!!!! I must say it did take a while .... but these folks really do not seem to have much of a control over this site. Thanks for the kind words and all the best to you and Sharon and your lovely daughters. Do contact me direct . What a great experience, wonderful island and superb host/hostess!! 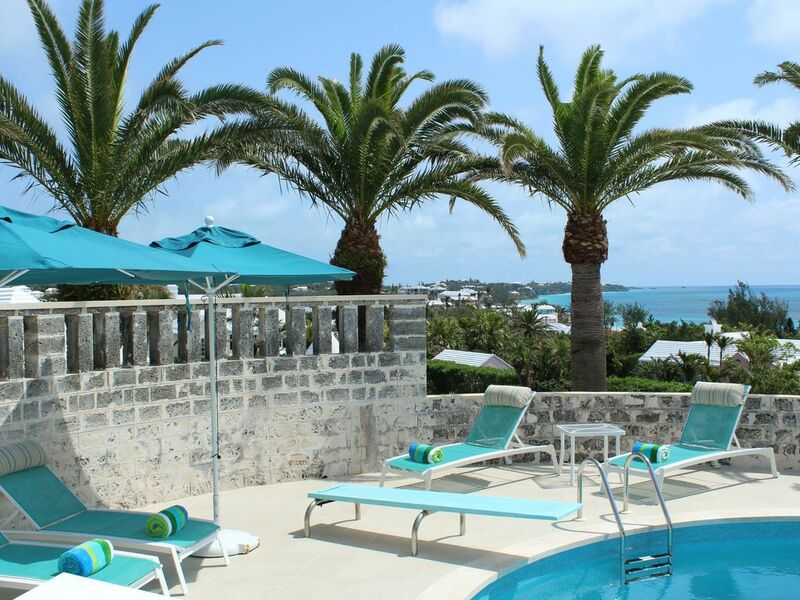 Whether you're new to or a repeat visitor to Bermuda, Watch Hill Manor is a great spot to stay. Looking for hosts who can make you feel welcomed, know the island front to back, bend over backwards to make your stay flawless??? Then Brian and Ineke are the perfect couple. From the rum swizzle greetings on day one, to the superb breakfasts daily, to tailored advice on what to see, when and where, making bookings, daily debriefs poolside on what went right or could be better... they're are an accommodating wealth of info coupled with graciousness and charm. Our room was sparkling clean, snacks provided, fresh-air dried linens and custom toiletries...all combined to welcome us New Englanders. And the view...flowers, shrubs, beautiful grounds and surrounding homes...couldn't be better. With the local beach a short walk away and bus transportation equally convenient (although a bit like a NACAR qualifier) there's no need to fret about getting scooters, paying for cabs regularly or any other transportation issues...pretty simple and convenient and a chance to see the island up close and personal, although a bit of a blur at times..
We love the civility, beauty, comfort and convenience of Bermuda and having cruised here a few times and stayed elsewhere on island, we've found our new go-to spot...you should too. Enjoy!! We visited Bermuda with another couple last week. It was a first time for both couples. We had decided to book through VRBO because we found hotel rates to be outrageous, but we were a little nervous, as it was our first time booking with VRBO outside the US. We needn’t have been. There were 3 items to consider in our review: venue, accommodations, and service. The house is in a great location: quiet and close to the beach. It is about 10-15 from the airport and St George, and maybe 20 from Hamilton. There is a beautiful, totally uncrowded, beach that is a short 10-15 minute walk from the house. The ocean is clear and warm, and the sand a clean coral and pink color. There are even some public showers at the far end of the beach. As for the accommodations, we stayed in a good sized two bedroom apartment. There is a small refrigerator but no cooking facilities. Unless you plan to eat dinner in however, they really are not needed. It does have a large living room, and just outside is a patio overlooking the ocean. Beautiful. The air conditioning was quite comfortable. Oh, and there is a nice pool and tennis courts at the facility. The service is what gave this the five stars. Brian and Ineka couldn’t have been more helpful or friendly. Breakfast was included, and Brian is quite the chef. The menu was different each morning; Spanish omelet, eggs Benedict, French toast, etc plus coffee and either fruit and yogurt or a glass of fruit juice each day. The hollandaise sauce is homemade, not packaged. Since we were unfamiliar with restaurants, Brian made recommendations for us each night (all were very good), he reserved the tables for us, and most nights he drove us to them (we arranged for a taxi back). From our prior VRBO experiences, we really did not expect any service, but we were delighted with our stay. In our opinion, you really could not get more from a vacation resort. Both Ineke and I are delighted you enjoyed your stay with us along with your good friends, Richard and Mary Lee. We do appreciate your taking the time to write us such a, "glowing review". These reviews do help tell the story to other travelers which paid advertising can not do. We do hope to see, "ya'll" again, as it was a delightful experience for us too. I can't say enough great things about “Watch Hill Manor” at 23 Knapton Estates Road. Brian and Ineke made our 5 day stay into one fabulous mini vacation. Bermuda was on my bucket list and so I dragged my husband kicking and screaming in opposition all the way. Needless to say, on our last day there he said we should have stayed longer so we will be going back and doing the things we missed, next year I hope. If it's your first time, stay at least five-seven full days, not including travel days if you want to really see all the island has to offer. Before we got there Brian sent me a ton of information about the island, where to eat, what to see, etc. After our cab dropped us off, Brian showed us our immaculate, comfortable, and modern apartment that had everything one would need for the trip, including fabulous soaps and shampoos, then took us to the grocery store and later made a simply yummy Swizzle for us to start our evening. Then they drove us to and from Tucker's Point Club for dinner. Cabs don't like such short trips, but love the longer ones. The next morning Brian printed out an itinerary for our day trip to St. George and gave us bus passes to get started. We also got a map of the island and a bus route schedule. The bus stop is a 4-5 minute walk down the hill and it is a beautiful walk. It's easy to get to Hamilton or St. George and the tourist sites by bus. Another three minutes walk past the bus stop is a beautiful uncrowded, scrumptious beach with bathrooms so an easy way to spend a few hours or the day. Just so you don't have to pack a huge suitcase they have a laundry room which you can use. Also a gas grill if you want to stay home and grill something for dinner. The kitchen in the apartment is small but has everything you might need for making a meal. We spent most evenings in as we were tired from sightseeing all day. Just beware you will need to catch a taxi home if you are out late as the buses stop in the early evening. When you look at the price of a hotel and compare it to what you get here, hands down this is an outstanding choice. You can use the tennis court if you bring your rackets, and they have a beautiful pool you can use during the day. Be aware that they don't allow children, which meant every morning was quiet and pleasant with only the sound of the birds joining us for breakfast on our own little terrace which overlooked the water. All in all a great place to stay! Thank you so much for taking the time to write a review of Watch Hill Manor and we are delighted you had such a great time. Both Ineke and I enjoyed meeting you both and thank you so much for such a glowing review. We do hope you will come back soon, as your stay was such a short one and there is still much for you to see and do. We are now into the full swing of the America's Cup action, along with the Tall Ships and coming soon the J-Boats. We've been out on the water several times to see the action, however did miss yesterday's spectacular, "Pitch Pole", by Team New Zealand. Do hope our paths will cross again in the future and again, thanks for taking the time to do a review. Watch Hill Manor is located in a very quiet area of Smith's Parish which is well off the main road. The neighbourhood is up-market and has very nice surroundings and stunning views. It is very central to Hamilton and the town of St. George. We have 2 bus routes that pass by the house, all within 3 to 5 min walk from the gate. Beaches, supermarkets,churches, restaurants, golf all within minutes away by moped. Spittal Pond Nature Reserve is a 10 min walk away where one can meander along viewing flower and fauna, birds, and wild life. One can also see the Parrot Fish feeding on the reef and in Spring, migrating whales just out off of the reef line making their way to the Arctic for the Summer. PRICE FOR 2 B/R FOR 3 PERSONS $445 PER NIGHT PRICE FOR 2 B/R FOR 2 PERSONS $430 PER NIGHT NOTE: THIS PRICES IS INCLUSIVE OF A FULL COOKED BREAKFAST EACH MORNING OF THE STAY. STAYS LESS THAN 4 NIGHTS ATTRACT A CLEANING FEE OF $150.00 100% refund given if cancelled up to one month prior to arrival date. 50% refund up to 2 weeks from arrival date. IF ROOMS ARE RESOLD, WE WILL REFUND YOU THE FUNDS RECOVERED, FOR NIGHTS SOLD.